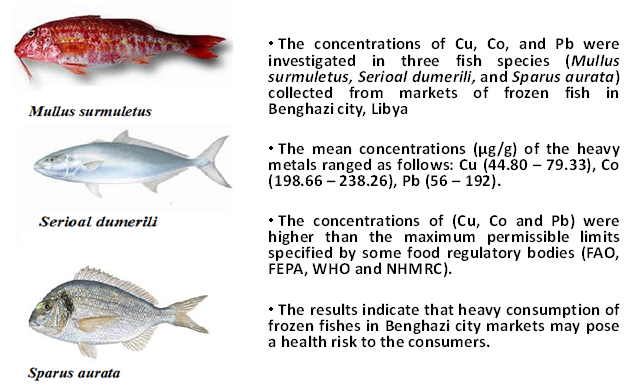 The concentrations of some heavy metals (Cu, Co, and Pb) were investigated in muscle, liver and gills of three fish species (Mullus surmuletus, Seriola dumerili, and Sparus aurata) collected from frozen fish markets in Benghazi city, Libya, during winter 2016, using flame atomic absorption spectrometry (FAAS). The mean concentrations (μg/g) of the heavy metals in fish tissues ranged as follows: Cu (44.80 – 79.33), Co (198.66 – 238.26), Pb (56 – 192). The highest mean concentration, 238.26μg/g was recorded for Co in the muscle of Mullus surmuletus, on the other, the lowest mean concentration, 44.80 μg/g, was recorded for Cu in gills of Mullus surmuletus. The concentrations for Cu and Pb in all fish samples were over the Effect Range-Low (ERL) but were under the Effect Range-Median (ERM) in metal pollution index (MPI). The concentrations of (Cu, Co and Pb) were higher than the maximum permissible limits specified by some food regulatory bodies like WHO. The results indicate that heavy consumption of frozen fishes in Benghazi city markets may pose a health risk to the consumers.
. Duruibe J.O., Ogwuegbu M.C., Egwurugwu J.N. Int. J. Phys. 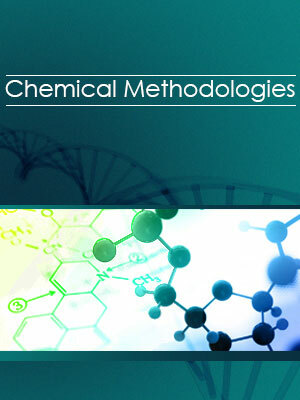 Sci., 2007, 2:112.
. Forstner U., Wittman W. Metal pollution in the aquatic environment. Berlin, Heidelberg, Germany: Springer-Verlag, 1981, 272:486.
. Chapman D., Water quality Assessment. A guide to the use of biota, sediment and water in environmental monitoring. London, Chapman and Hill Publishers1992.
. Dural M.M.Z., Goksu L.O.A. Food Chemistry, 2007, p. 415.
. Ikem,. Egiebor N., Nyavor K. Water Air Soil Pollution, 2003, p. 51.
 WHO (World Health Organization), Concise International Chemical Assessment Document 69 COBALT AND INORGANIC COBALT COMPOUNDS,2006.